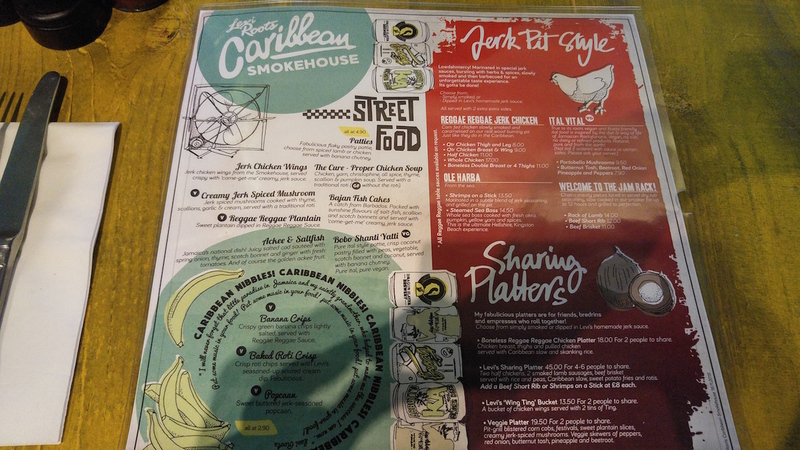 I went to visit this new restaurant from Mr reggae reggae Levi Roots. The venue has a decent vibe to it, reggae style music in teh background and a cool smokehouse caribbean style vibe, you can even learn some Jamaican when you visit the rest rooms. The Chicken here is halal and so is the lamb ribs, however the ribs where not available, something that was only mentioned at the time of ordering and not before. 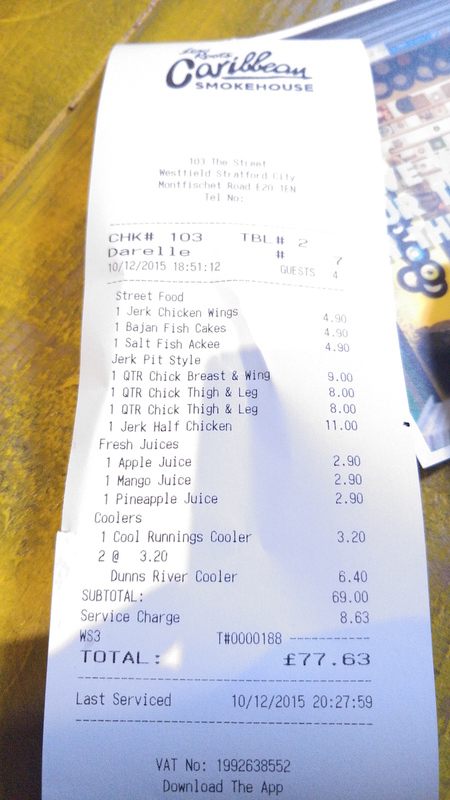 I was with 3 others, so 4 in total, we all ordered the jerk Chicken. Menu is among the photos below, with each main you get to pick 2 sides, and there is a wide range of sides you can chose from. The odd thing about this place is the way they served ALL the chicken together. I ordered a half chicken – they serve chicken here pre cut, so Leg, thigh and breast. The pieces are small. 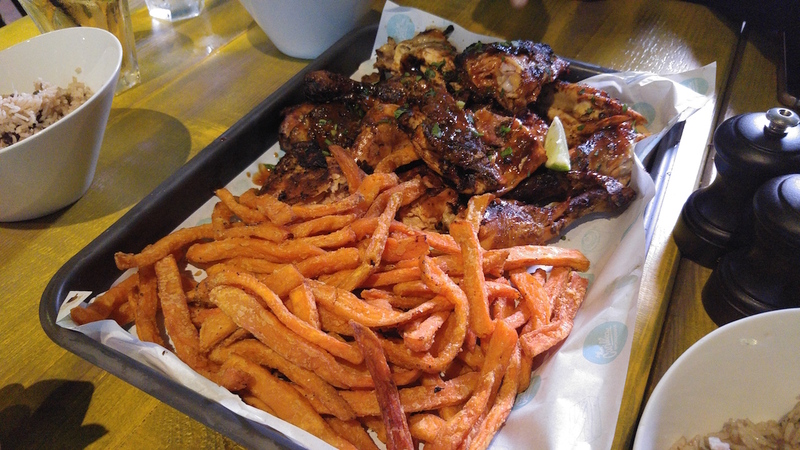 This meant that an order 3 1/4 chicken meals and a half chicken meal was all served on one tray along with a 2 portions of a side sweet potato fires. We found this confusing as we ordered individual meals and everything was served together, which was confusing and we didn’t know who ordered what. The chicken itself was rather underwhelming, i found it dry and it lacked the freshness one would expect. There was a lack of flavour and i was expecting a more robust taste due to their unique cooking methods. 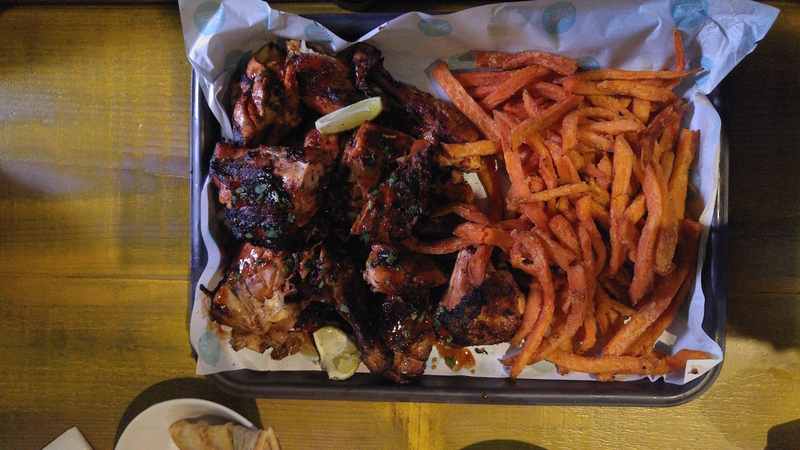 If you like your chicken then stick with you nandos for your chicken fix. The chicken here was defiantly not worth the trip, i was really expecting a lot more. Perhaps me and my friends also made the mistake of limiting our sides to just rice and peas (which was very good, rice was soft and flavoursome) and sweet potato fires. Drinks, I ordered a coconut and lime refresher but had to send it back as it was awful and got a mango juice instead. 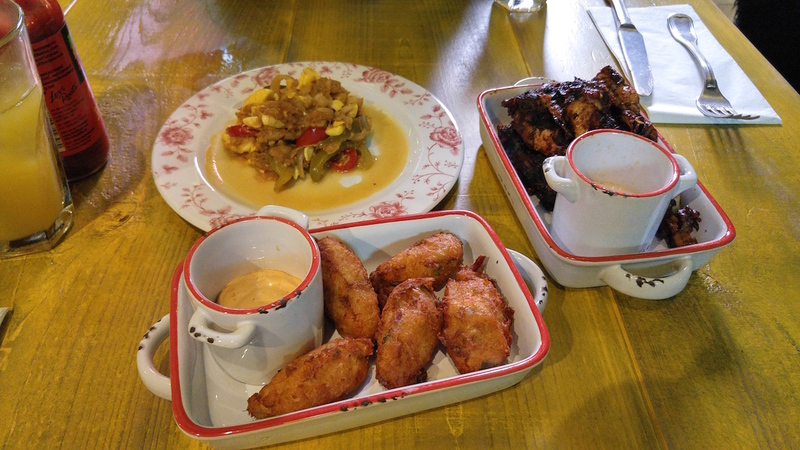 Oh, i forgot the sides, we ordered fish cakes – very good, as was the salt fish but the chicken wings were not anything to write about. Portion sizes here were good. We had a lot of food left over, this is a reflection of the food taste more than anything – however they run out of packaging and put the left over chicken and rice in a parcel of kitchen foil. Good concept. Nice venue but the food did not deliver and not all items such as the lamb ribs where not available. Did not like the fact that all of the food was served on one tray. 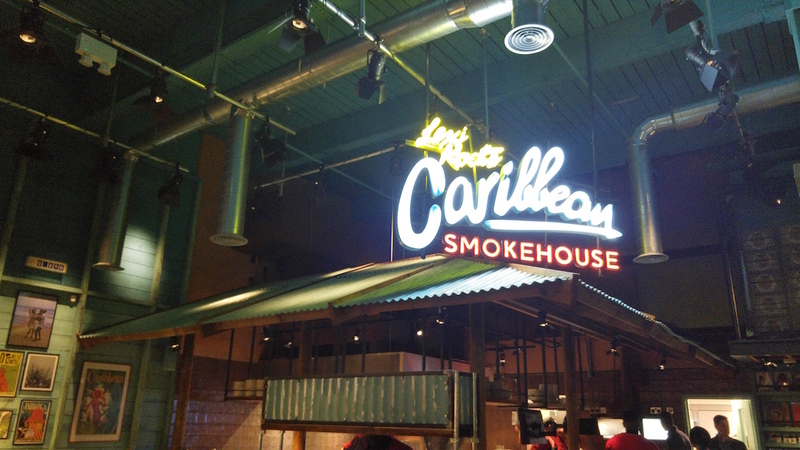 Hey Buddy!, I found this information for you: "Levi Roots Caribbean Smokehouse". 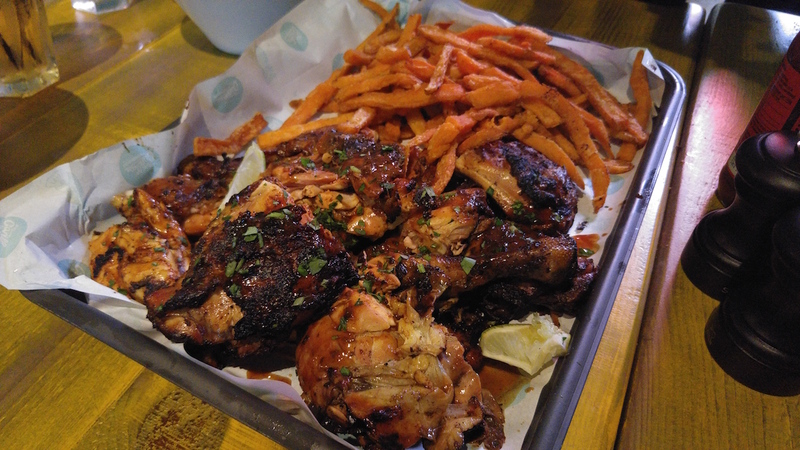 Here is the website link: http://halalfoodguy.co.uk/levi-roots-caribbean-smokehouse/. Thank you.